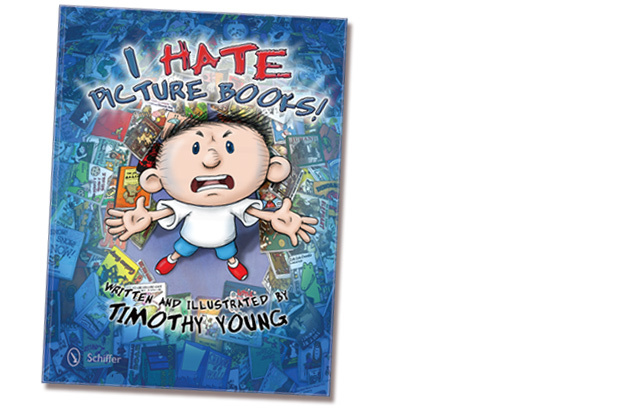 Author Visits, Books and Illustrations by Timothy Young - Creatures & Characters - I Hate Picture Books! I Hate Picture Books! is published by Schiffer Publishing. Retailers can purchase copies here. Why does Max hate his picture books? Will he really throw them in the trash? Find out in I Hate Picture Books! I Hate Picture Books! lovingly pokes fun at some of the classics of children's literature. Readers will have fun following Max's story while recognizing many books that they've also read. Using parody, pastiche, and whimsical satire, the author fills his story with references to some of the greatest children's books ever, while Max's bedroom floor is covered in hundreds of books as well. I Hate Picture Books! was released on February 28th, 2013. On March 2nd it had it's book launch at Books Of Wonder in New York City. It is available worldwide. Ask for it at your local bookstore. If they don't carry it, ask them to get it for you. You can also find reviews on our old website here and watch the book trailer here. If you want the pdf of the list of books featured in I Hate Picture Books!, here it is.